A classic solution to an expanding wine collection, our J.K. Adams Harwood 12-Bottle Wine Rack is crafted from sustainably harvested Ash and features a simple modular design. You can quickly and easily assemble this rack in a variety of ways from a traditional square to a stepped design to best fit your space and collection. Additional sections can be added easily. Our 12-Bottle Hardwood Wine Rack assembled as shown measures 13-3/4" x 11" x 13-3/4" h.
J.K. Adams Hardwood 12-Bottle Wine Rack is rated 4.5 out of 5 by 41. Rated 5 out of 5 by donwor from Great wine rack This A.J. Adams wine rack is ideal for customizing wine storage. One can maximize the number of bottles stored in a space because of the modular design. I wanted my wine stored inside a cabinet, and traditional wine racks wouldn't fit. By using 2 sets of the Adams racks, I could utilize an upper cabinet perfectly. If I want to move it at some point, I can easily reconfigure it to fit a new space or add more racks. When I assembled mine, I didn't get it quite level, but this is still very sturdy, doesn't tip easily, and the price is very reasonable! Rated 4 out of 5 by ElTeej from Great product, and easy to assemble Years ago I bought a similar thing from a large Swedish retailer, and it was an absolute pain to build - the bits wouldn't fit together, the wood split - total garbage. This was a totally different experience - easy to assemble, and fits perfectly in the space available. Each box comes with 16 beams and 56 pins (I used 15 beams and 50 pins for my configuration. I'd recommend using a good heavy mallet to make sure that the pins go all the way in, and once you've completed it go around and give everything a couple of good whacks to make sure everything is properly seated. Bear in mind that the item description is a little misleading - it says that this is a 12-bottle rack, but in the configuration I used it only stores 10 bottles - YMMV depending on how you put it together. The total width of 2 "cells" is 9 3/8", a single cell is 5 3/8", and you can calculate the size by multiplying the overall number of cells by 4" and then add 1 3/8" to give you the total space required (would have been useful to have this information in the product description). I was debating whether to buy this or the Storvino crates, but since those don't stack so well in a vertical configuration, this was a better choice. I would buy this product again. Rated 5 out of 5 by NancyBelle from Design your own wine rack I purchased one of these racks from a neighbor. It was quite large allowing me to store over 200 bottles. I wanted to build a new one and add to the one I had. I purchased three of these sets and constructed two separate towers that fit beautifully into my small hall linen closet. The remainder I used to add on to the one I had in my cellar. You need a rubber mallet but you can do this all on your own...no help necessary. Rated 5 out of 5 by oreosmeow from Love it! I have a wine rack on my counter in the kitchen, but needed some additional wine storage. 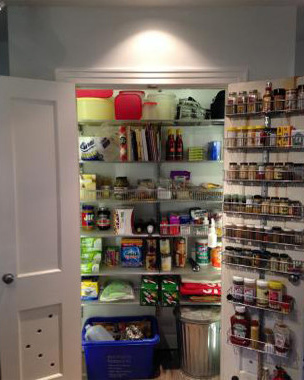 This is perfect - i love that I can expand it if I need to, and make it fit on top of my little freezer. Also love that I can paint/stain it if I'd like. Very sturdy and easy to put together. Rated 5 out of 5 by Rafa from Endless possibilities! This type of wine rack construction allowed to design my own, apply the tint and finish of my choice (Merlot for the length of the big 'sticks', a lighter tint for the dowels and a darker (espresso) for the ends of the big stick showing (front). The result is a "unique" conversation piece, which holds my wine very well. It's like playing with Legos! Rated 4 out of 5 by Jimboallthetime from Nice wine rack I already had set up part of my basement as a wine cellar so this product fit perfect with the existing setup. What's nice is that you can adjust nicely to awkward space. It's a bit expensive but it was easy to put together (have a rubber mallet handy). I did order 2 which the site said were in stock. The store called me before the pick up date and told me there was only 1 in stock. I waited an extra week. The pick up couldn't have been easier. Drove up to the front of the store and they brought it right out. All in all, a good experience. Rated 5 out of 5 by Marilynn from fits Fits perfect under my buffet counter. Would fit anywhere, in the smallest of spaces and store the max amount of bottles. Rated 5 out of 5 by Jessicon from Simple Elegance I recently bought and assembled the 40 bottle version of this wine rack. Let me say, it is adult tinker toys on steroids! If you are experiencing a rough day, just grab a rubber mallet (a MUST), a glass of wine, and start pounding away! You do not need to hold back when assembling this product. It is durable and with some hard hits went together perfectly. Some of the reviews mention that it is hard to align. Because I was assembling it on a hard concrete surface, I didn't have that problem. When sections were assembled, I made sure to lay it flat and hold it to the ground and hit it with the mallet until flat. I repeated the process on it's sides as well. If you take some time, and don't hold back your swing of the mallet, you can get a pretty straight wine rack! Plus it is ROCK SOLID! I LOVE the versatility in that you can make whatever shape you would like and you can make the wine rack larger as your wine collection grows! Along with that, you can make it fit in whatever space you have! Our wine collection lives in the cupboard under the stairs, so I created a stair step pattern. In fact, we just added to our collection and I will be purchasing the 12 bottle kit to add to our existing 40 bottle setup. I did mention that it is like tinker toys, but once assembled it looks like those great wine racks that you see in those fancy cave cellers. It's simply elegant! Rated 5 out of 5 by Grannmarie from Awesome for gift wrap! I have lots of gift wrap and nothing to store it in. I also had a large area over our laundry room fridge that was deep and didn't know what to do with that space. So I went to The Container Store because it always seems to have a solution and I came across this wine rack. Since it was design your own I was able to add on until my space was filled! Rated 5 out of 5 by Pensrok from Great purchase I bought this product for my husband and he absolutely loves it! Great storage and quite sturdy. Rated 3 out of 5 by Barbie8 from great storage This wine rack is so sturdy, but it is not cheap. Also, I found it very difficult to assemble. It looks as if it would be easy, but NO! It took a lot of pounding and swearing to get it together, and is very difficult to get perfectly aligned. I would not do it again. Rated 1 out of 5 by DNSinger from Tinker toys are more rewarding This wine rack for the price is not worth the frustration and energy to put it together. Once together the pegs do not sit evenly (and I consider myself to be pretty crafty) so the rack is very unstable. Not a safe feeling for expensive bottles of wine. Rated 5 out of 5 by blazegrl90 from Very sturdy wine rack This wine rack is somewhat hard to put together (definitely need a rubber mallet and some patience to make it level), but once it's together, it's a rock! Super sturdy, and I love that I can always add to it later. Matches really well with my J.K. Adams spice rack and made in the USA also! Rated 4 out of 5 by Elizabeith from Love it - and get a rubber mallot Christmas gift for my husband - he loved it. And be sure to have a rubber mallot around, he used my shoe for a while...will be taking that to the cobbler! Rated 4 out of 5 by cjh79 from Great product This thing is great. Yes, it takes some effort to put it together. The pins are a tight fit. This is a good thing, unless you want it to fall apart and drop your wine all over the place. Get yourself a rubber mallet, a hard surface, and a six pack of beer, and go to town. The pins are sturdy and can take a hard mallet hit, don't be shy. After assembling it you will feel a nice bit of DIY satisfaction every time you look at it. My only complaint is that some of the holes on the hexagonal beams are not perfectly centered. This causes the rack to be slightly out of square in some spots. It's barely noticeable from a distance and once you've got it full of bottles, but if you look closely it's a little wonky. I don't mind it, it adds to the hand crafted look and it's nice to have something that doesn't look like a robot built it. However some might be bothered by it. I have attached a picture of one such off-center hole. Rated 5 out of 5 by AlbanyTom from Versatile and elegant I don't understand the one star reviews. Assembly couldn't have been easier. It took about half an hour, if that. I opted for the basic square layout, but I love the fact that I could have chosen so many others. Larger layouts are only limited by your imagination. Rated 5 out of 5 by butters22 from Love this!!! I have been eyeing this for quite some time and finally bought it for my husband who loves to drink wine. It is like tinker toys for adults - super fun to construct and gives you a lot of options about how you want to set it up so it could go anywhere. Great construction, super easy and good quality. Love it! Rated 4 out of 5 by IRONE from Difficult to Assemble I read all of the reviews and most claim that this was so easy to assemble.....perhaps I missed something? I collect wine and have been looking for a way to store it and was thrilled to come across this wine rack. I love that you can make it into various shapes and sizes - definitely a plus! End product is great and fits my need, but assembling it was not so great. I bought a rubber mallot and that definitely helped, but I found it rather difficult to put together. I didn't use glue, but since I bought the 40+ bottle rack, perhaps I should have. It was a frustrating adventure, but I was determined to complete the task. Rated 5 out of 5 by Veet from Great Wine Rack This product has great flexibility as it can be configured in a shape and size to fit your needs. If needed it can be configured to fit inside a smaller cabinet spaces of various dimensions and you can add on as your personal wine cellar grows. If your collection out grows your initial space it can also work as a decent looking free standing wine rack as well. Also nice the product is made in the good ole USA from renewable resources. Rated 5 out of 5 by RyanB from Great wine rack We buy wine in cases frequently in order to get reduced prices. With little option for storage we used to simply keep them in the boxes but it was not very attractive and many of the boxes were not very stable. These wooden wine racks are really great for anyone who buys bulk wine. If you have a very small storage need I would pick something a little less plain looking and stylish but these were great for our quantity. I will say the assembly was a rather large task. You really need to hammer, with force, each little peg in place with a rubber mallet. All in all, from unpacking the box to planning the shape we wanted (a great feature of this product) it probably took about 90 minutes. The advantage of all this effort is that the final rack is extremely stable and will not wobble or come undone at all, even when stacked full with wine. We did not use any glue as the pegs were plenty tight. Lastly, even though it says it holds 40, it actually holds 44 as there is room for bottles on the top row. I will be buying two more of these for the rest of our wine. A great product that turned out even better than I expected. Rated 5 out of 5 by chilin from Design your own wine racks I just purchased this wine rack and it is going to be very serviceable and expandable. It's very strong and stable and can be expanded both vertically and horizonally if need be. I started with a 12 bottle rack. Rated 1 out of 5 by RosieJ from Difficult to assemble This is way too difficult to put together. The pieces do not fit together easily and you have to hammer some of them in, which ends up making it uneven. I am going to return it. Rated 5 out of 5 by Mike12 from Great Wine Rack Very sturdy rack. Easy to put together in any configuration. Easy to add more bottle spaces. Rated 5 out of 5 by greg from Works where others do not Rack can be modified (sawed / sanded to fit in odd-shaped cabinets) and then painted / stained to fit any decor. Rated 1 out of 5 by JudyS from Are you kidding? This was the worst assembly nightmare ever! I should have known when they included 8 extra pegs. Tinker toys are made better. Very poor consistency of pegs, and it took an hour to assemble this 13" square wine rack. Rated 5 out of 5 by LDona24 from Great wine rack This was easy to assemble and seems very sturdy. Because you can make the rack long and low or tall and thin, I was able to make it fit perfectly into the space I had for it. Best of all, it looks great. Rated 5 out of 5 by CritterA from perfect solution for closet storage of wine! We bought two racks and put them together vertically and it fits perfectly to one corner of our hall closet. It holds more bottles in less space than the other racks we were considering. We also use it for sparkling water and bottles of similar shapes. It has certainly cleaned up our closet. Rated 5 out of 5 by mrjodhpurs from I bought this wine rack years ago, and now I'm adding on. I am so glad this is still available. Rated 4 out of 5 by carrreokie from wine rack Purchased this simple wine rack for a storeage cabinet. Easy to assemble. Many different options for assembly. All peices arrived all peices fit. Would buy this again and would recommend to others. Arrived quickly also. how tall is a 13.75&quot; section when there is a standard bottle of wine on it? My guess is about 16.75&quot; but I wanted to check to make sure. Thank you. Basically how high above does a bottle sit? You're right - with a bottle of wine on the top rack, it is about 16.75&quot; tall. I was curious if this system had a maximum height? We already own two of the 40-Bottle kits but want to expand. Structurally, I would go three racks high, as long as you keep the base at least the same as the hight. If you keep a ratio of base=1.5 x hight, you could go higher, but in any case I would feel better anchoring the back of the racks to a wall. What are the dimensions for the 40 bottle rack? The 40-bottle rack is designed to be 7 rows of 5 bottles housed within the structure (8 dowels x 6 dowels) with the last 5 stored on top to give you the total of 40 bottles. Assembled, the dimensions of our rack are 29-5/8&quot; x 21-3/4&quot;. It took two of us about an hour, and, yes, you need a mallet. If you plan to make a different formation, you may need extra pins. I counted 16 extra pins included in the 40-bottle rack kit, which we didn't use because we made the standard formation. You may find it useful to know that an extra row (a pin assembled with a connector dowel) measures 4&quot;. The diameter of the connector dowel is 1-1/4&quot;. I'm very happy with this wine rack -- it is super solid. It appears that there are 35 contained compartments(more if place bottles on top) can you purchase partial units? There is also a 12 bottle system that you can use to supplement if needed. If the kit is assembled to stack two bottles of wine per row, how wide is the total width? Thank you. It would be just under 9-1/4&quot; wide if it was assembled for two bottles per row. We only sell this product in kits to hold 12 or 40 wine bottles. We do not sell individual pieces. Could I configure this so that two rows fit in 8 3/4 high cabinet? The cabinet I would like to put this in is only 8 3/4&quot; high x 22&quot; wide. I would like to fit two complete rows of the rack in this space. Is that enough clearance for height? Or would I have to only assemble one row and have the bottle rest on top? Assembling our Hardwood Rack two tiers in height would be about 9-1/4&quot; high. We suggest one tier in height and allowing additional bottles to rest on the top of the rack. Are the openings large enough to hold champagne bottles? Unfortunately, our Hardwood Wine Racks do not accommodate champagne bottles. See our product recommendation below for some wine rack options that do accommodate champagne bottles.